Vulcanize is a real carcase bull, terrific hind quarter, sound feet and legs. His Dam is from our solid Doreen line that goes back to Doreen 57, one of our exceptional breeding Doreen 39 daughters. 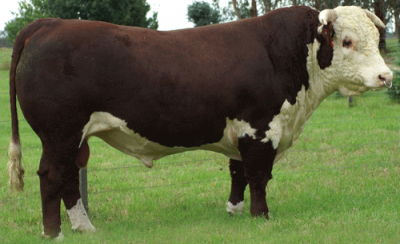 Doreen 57 sold five of her six sons at the Hereford National. The Magnum progeny are breeding with great consistency and we are very pleased with his progeny. His sons have sold to $9,000.